Kids are amazing. Here at Alaska Pediatric Surgery, our business is keeping kids healthy. If your child requires a pediatric surgeon in Anchorage, please let us know. If your child is healthy and feeling well (what we like to hear! ), then maybe you can enjoy sharing some of these fun facts about children with them! Linguists were baffled in the 1970s and 1980s when 50 different children in Nicaragua, who happened to be deaf, were put together in a school where they spontaneously developed their own sign language. Nowadays, linguists use this spontaneously developed language to study how language comes to be in general. And they would be doing so without a useful tool if it weren’t for these amazing children! Many studies corroborate the idea that teaching a child multiple languages early on can have amazing beneficial effects in regards to their ability to learn empathy related skills. Researchers say this could possibly be attributed to their metalinguistic understanding, as they will learn to look for social cues in order to figure out which language to converse with who. If you lived in the United States any time between the 70s and the 90s, then you probably remember the phrase “we’ll be right back after these messages” before every commercial during kids shows. This was mandated by the FCC at the time to help children be able to differentiate between the television show and commercials. Remember when people thought video games were corrupting kids? While there is certainly too much of a good thing, many researchers have studied the effects of video games on children. According to this study, kids who play video games between one and three hours a day saw higher life satisfaction, better prosocial behavior, and less externalizing or internalizing of problems. The hit Nickelodeon series of campaign specials called Kids Pick the President has aired since 1988. In that time, the kids’ pick has been correct every single time, except for the 2004 and 2016 elections. “Eat your broccoli” is a common trope in America, and many parents find it a struggle to get their kids to eat their greens. Apparently, that is not as much of a problem in Japan, where they changed the broccoli in the film Inside Out to bell peppers because kids in Japan don’t find broccoli and other greens to be gross. 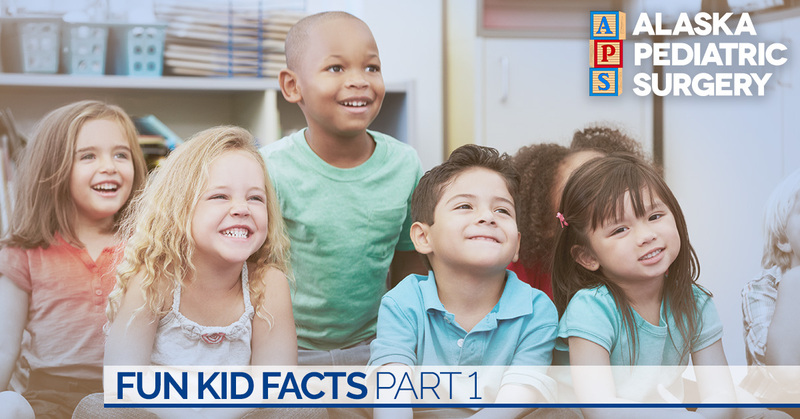 Hopefully these fun child facts proved interesting! If your child requires pediatric surgery in Anchorage, please reach out to Alaska Pediatric Surgery. Feel free to give us a call for more information. One of our friendly and knowledgeable representatives will be happy to answer any questions that you may have.